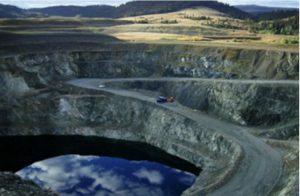 BRITISH COLUMBIA – The government of Canada has rejected the proposed Ajax copper-gold mine 3 km south of Kamloops. The project is owned 80% by KGHM Polska Miedz of Poland and 20% by Abacus Mining and Exploration of Vancouver. The federal decision follows an earlier decision by British Columbia to withhold a provincial environmental certificate. Abacus says that Ajax has 2.7 billion lb. of copper, 2.6 million oz. of gold and 5.3 million oz. of silver in proven and probable reserves. It would take a capex commitment of $1.3 billion to create an open pit mine and 65,000-t/d mill. The project carried a pre-tax net present value (8% discount) of $429 million and a pre-tax internal rate of return of 13.4%. The payback was only 6.5 years. The Ajax site is the home of the former Afton mine, mill and smelter operated by Teck Resources from 1987 to 1997. Abacus bought the property from Teck Cominco in 2005. It would be nice to know just why the government rejected the proposal. Presumably, the company’s plans were not able to adequately mitigate certain expected impacts. Another good project rejected for no good reason. Perhaps when BC sinks into recession a few people will wake up to the disastrous policies being followed here. Expect longer wait times at local hospitals and higher provincial taxes to make up the revenue shortfalls.